Drip irrigation tape is an extremely efficient method of watering crops, providing more uniform, timely and precise application of water than all other irrigation methods. 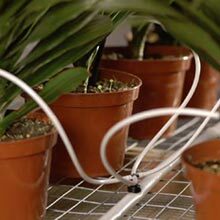 The method involves constructing a network of drip irrigation tape which delivers water to the base of the plants, either on the soil surface or underneath, directly on the root zone. It offers steady drops of water over time instead of the traditional stream produced by a hose or sprinkler. Drip irrigation offers many benefits and the result of these advantages is more rapid growth and earlier harvest, higher quality crops at higher yields, as well as cost savings associated with greatly reduced water usage. 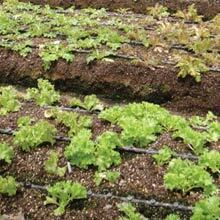 Drip irrigation tape is high-quality polyethylene resin tubing. This thin wall emitter tubing can vary widely in thickness, but the 8 mil type offered by TekSupply is the most widely used in the market. The tube is flattened until it is pressurized with water and becomes round, usually at an operating pressure of 10 PSI or below. Since it is coiled in the flattened form, shipping, handling and storage is easier and less bulky than round tubing. 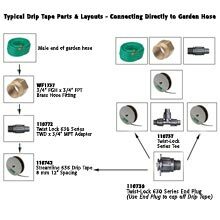 What can I grow using drip irrigation tape? 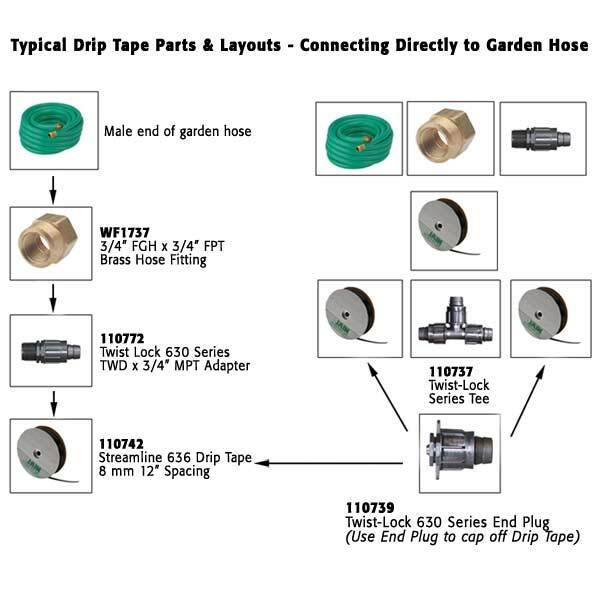 Drip irrigation tape systems are used mostly for row crops, but can also be used in the cut flower industry. It is ideal for growing many closely spaced berry and vegetable crops, such as strawberries, lettuce, cabbage, cauliflower, celery, tomatoes, onions and even cotton. Permanently buried tape systems can be used to grow crops such as corn, soybeans and alfalfa. Drip tape systems are useful because they can work for a large-scale commercial operation, but are also ideal for a smaller backyard grower. You can customize the system to be as small or as large as you need, and also to the specific needs of the crops you are growing. Why are drip tape systems the preferred method of watering? Drip tape systems allow better control over the amount of water being applied, which means crops are healthier and less water is wasted. Alternative watering methods often lead to inefficient use of water, due to misapplication in areas where water is not needed, wind drift, evaporation and other irregularities. Drip tape can also be used to accurately deliver agricultural fertilizers and chemicals which protect against insects and disease. This precise control prevents misapplication situations, which could be hazardous to your crops if they receive too much or too little of the chemicals. Since all of your plants are receiving the right amount of water and fertilizer exactly when they need it, your plants will mature faster and be higher in quality. This means that you can harvest earlier and bring your crops to market sooner than competitors, which increases profits. Further cost benefits can be realized due to the low energy and low pressure required for drip tape systems, which greatly reduces water usage. The cost benefits of a drip tape system far outweigh the initial investment, and it easily pays for itself before long. How long does the drip tape last? The length of time your drip tape system can be used and reused depends on a few different things. If you use 4 or 5 mil thickness, your drip tape may only last one season, but if you use 8 or 10 mil tape, it can be retrieved and reused for a number of seasons. If you plan to retrieve the tape at the end of the season, it should be laid on the surface of the soil or buried to a depth of less than 12". You could easily find yourself reusing drip tape 6 to 8 times, but many people prefer starting over each year with new tape. This is because people often don't want to deal with the hassles of retrieval or make any repairs to the tape that may be needed. What do I need to consider prior to installation? It is very important that your drip tape system be well planned to ensure that you don't waste time and money during the installation process and also to avoid disappointment with the final result. 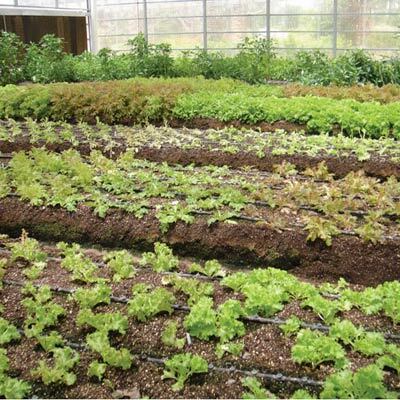 First, you should assess the row lengths, widths and other variations of the area in which you plan to grow so that you know exactly how much ground the drip tape will need to cover. You should also consider any slope or drainage issues the plot of land may have and how this will affect watering. Other important things to know are the different crop variations you plan to grow and what each of their water and fertilizer needs are, as well as their soil texture and chemistry information. Finally, you will need to know what the water quality is in the area and if it will be available for you to use on a constant basis. 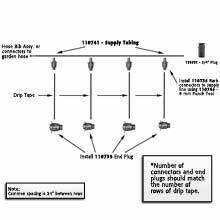 Another important aspect of the installation planning process is knowing how you want to use the drip tape system for the future. Your system should be designed so that it may be modified as your needs change, so bed widths and row configurations should be somewhat flexible. You should keep good records so that you can evaluate how effective and efficient your system is, and to keep track of maintenance practices. 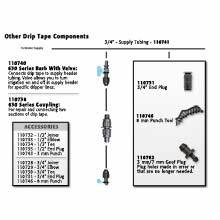 How do I set up my drip tape system? Water source: You will need a connection from your water supply, which can be one of several types of sources. You can use a pump if you are connecting to a well or a pond, a valve if you are connecting to a sprinkler system, or a faucet or hose. Backflow prevention device: This is used to prevent backflow water from contaminating your household drinking water. We recommend our Check Valve Backflow Preventer. Filter: You will need a filter attached to the backflow prevention device to keep debris from blocking the water flow. We recommend our Y-Filter with Flush Valve. Pressure regulation device: This is used to make sure that the water flow reaching your plants is not too strong. You need to have the right PSI in order for the drip tape system to be successful. We recommend our 10 PSI Pressure Regulator. Adapter: Now you are ready to attach the drip tape to the pressure regulation device, but you will need an adapter in order to connect these pieces. We recommend our Schedule 40 PVC I x M Adapter. 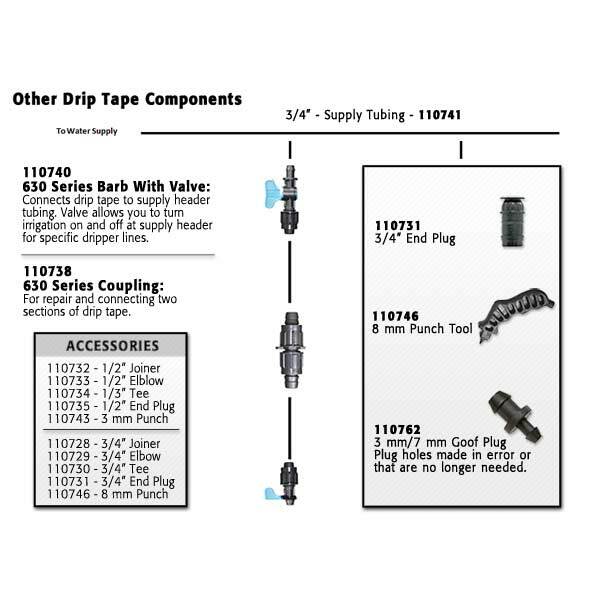 Drip tape: A minimum of 12" should separate each of the drippers (emitters) in your row. The drip tape tees off a main line of supply tubing using barb connectors. We recommend our Streamline™ 636 Drip Tape 0.4 GPH. Flush valves: These should be at the end of each line of drip tape to flush any stagnant water and allow you to winterize your system at the end of the season. We recommend our Green Back® In-Line Valves . 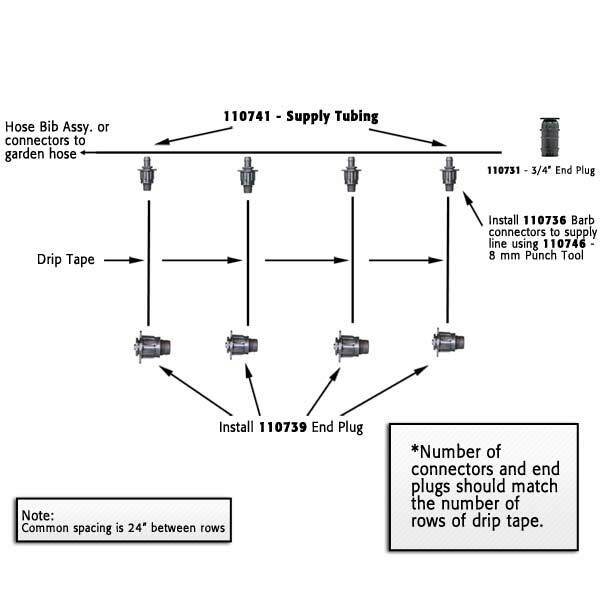 You will most likely need help in setting up your drip irrigation tape system, so give us a call today or Contact Us via Live Help and one of our knowledgeable National Account Managers can help!